The cost of fixing Fannie Mae and Freddie Mac, the mortgage companies that last year bought or guaranteed three-quarters of all U.S. home loans, will be at least $160 billion and could grow to as much as $1 trillion after the biggest bailout in American history. Fannie and Freddie, now 80 percent owned by U.S. taxpayers, already have drawn $145 billion from an unlimited line of government credit granted to ensure that home buyers can get loans while the private housing-finance industry is moribund. That surpasses the amount spent on rescues of American International Group Inc., General Motors Co. or Citigroup Inc., which have begun repaying their debts. “It is the mother of all bailouts,” said Edward Pinto, a former chief credit officer at Fannie Mae, who is now a consultant to the mortgage-finance industry. You’d think reversing the thrusters and getting us away from the event horizon of this fiscal black hole would be higher-up on the list congressional priorities than telling Macy’s how much it can charge you to use your debit card, wouldn’t you? Well, you’d be wrong. The Goldman-Sachs endorsed Dodd Bill barely lays a finger on the GSEs (though, if you’re lucky, maybe the newly-created consumer protection agency will send you a little pamphlet outlining the risks of investing in the housing sector). But hey, thank Kevin for giving us a little perspective here. 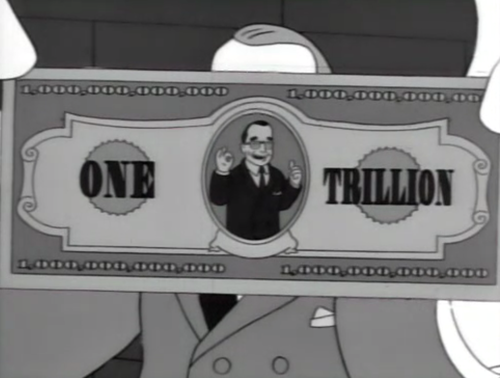 That $1 trillion is little more than a rounding error against the figure of our total public debt. One treeeeeeelion dollars. It’s one thing for a government to spend more money than we have. It’s another to spend more than we can imagine. Cross that threshold, and people will start to ask: how imaginary is the value of this unimaginable amount of money? The amazing thing to me is the credit given to Bernanke for doing nothing but kicking the can down the road. We had an easy chance to do the right thing which was to make the Fannie and Freddie bondholders share in the pain. Instead, Bernanke, Congress, and the Treasury collectively forced broke taxpayers to bail out wealthy bondholders. Now Bernanke is scrambling for an exit and praying for a miracle, but no exit or miracle will be found. How the hell can Fannie and Freddie pay a 10 percent annual dividend on the shares owned by taxpayers when they are losing billions of dollars a year? Secondly, can the Fed unload the $trillion in Fannie and Freddie debt on its balance sheet without disrupting the market? What can’t happen, won’t happen. Without government guarantees, there would be no mortgage market. With government guarantees taxpayer losses mount by the minute. … And supposedly Bernanke is a genius for this setup. We could pump up the economy through monetary policy, or we can have Fannie and Freddie continue to throw $100s of billions down the drain, socialize the auto industry, extend unemployment benefits to 99 weeks, etc. And if that isn’t enough there are also calls to move away from free trade policies. And then there’s the higher taxes we’ll pay in the future to cover the costs of debts run up in a futile attempt to stimulate the economy. Just as in the 1930s, the right seems to have decided that a little bit of socialism is better than a little bit of inflation. What do I mean by a little bit of inflation? I mean enough so that the post-September 2008 trend rate of inflation is the same as the pre-September 2008 trend rate of inflation. Apparently even that little bit of inflation is more distasteful than massive government intervention in the economy. The even greater irony is that this isn’t even one of those pick your poison cases. The inflation I am calling for would be nothing more than a continuation of the inflation that occurred in the previous two decades. We’d want it even if we hadn’t had a housing crisis and recession. I don’t recall conservatives complaining loudly that 2% inflation was a disaster when Clinton was president. So why the sudden and hysterical opposition to 2% inflation? Is that really a fate worse than socialism? Just to get serious for a moment; when I get upset at “Those People,” I am thinking about the Congressmen who created Fannie, Freddie and the CRA. And yes, I know that the CRA was only a minor factor in the crisis, but everyday it becomes clearer that Washington’s attempts to enlist Fannie and Freddie into their crusade to make every American a homeowner lies at the center of this crisis. Indeed the misdeeds of the “too-big-to-fail” banks (and their associated bailout with TARP funds), now comes in a distance third (or fourth if you include the Fed), far less costly to taxpayers than even the misbehavior of smaller banks that exploited the incompetence of the FDIC. The experts say we can’t eliminate F&F right now, and I suppose they are right. But only because we don”t have a monetary policy that stabilizes NGDP growth expectations.